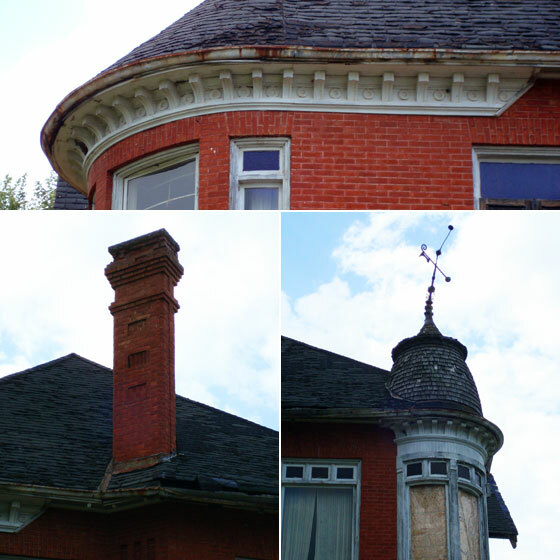 Do you ever see those formerly grand old houses, neglected, abandoned, abused and imagine repairing them? Rebuilding them? Restoring their beauty? Appreciating them? Every fall, Matt and I spend a weekend at his aunt’s and uncle’s cottage. We follow a two lane road north, driving past large farms that stretch between small towns. The leaves are changing and the trees on either side of the road are shades of gold, red and green. Coming into the last town before we reach the cottage, the speed limit drops and on our left is an old brick house. It sits on the crest of the hill, plywood squares covering its lower windows. The red brick is solid, while the porch sags. The paint is chipped, the shingles are flaking, the weather vane is bent. However, the charm is still evident. The beauty and the character and the potential and the tragedy of this house attract me every single time I see it. But I know a project like this is beyond me. To restore a house like this takes more effort, more money, more time, more energy and more passion than I have. However, someone else has felt the same attraction, and they have decided that they have the means to truly appreciate this house. This weekend as we crested the hill, I gasped in delight and surprise as I realized the house was being renovated. The joy I felt in seeing it finally being cared for is hard to explain. I live three hours away from this town. I don’t know anything about this house. I’ve never been in it. I have not met the owners. I have not seen the floor plans. But seeing the new third story, the fresh cedar shakes on the roof, the stripped wood on the turret, the scaffolding stretching up every side, I was very happy. I find great meaning in houses–even houses that aren’t mine. Caring for my house and its property, creating a home is a special experience for me. And I don’t think I’m the only one that feels this way. What about you? 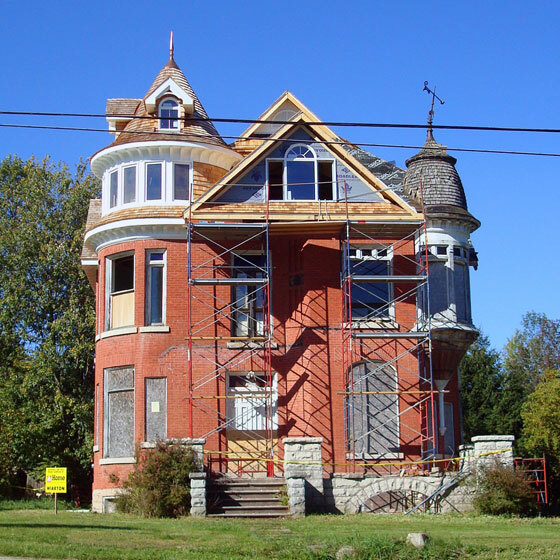 Do you ever dream of fixing up an old house? Or have you jumped in and done it (or doing it) already? Do you have an abandoned house that you admire? I get crazy excited over abandoned houses! Google “forgotten detroit”. There is a website and a book of all of the derelict buildings in Detroit! Makes me happy and want to cry at the same time! Aaaah. I can totally see myself getting sucked into that site. 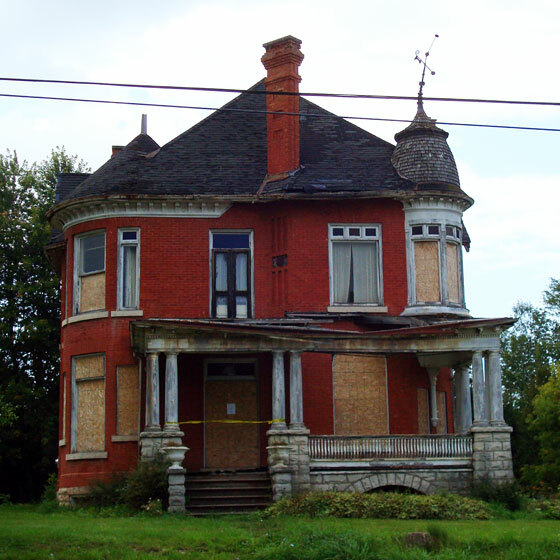 There are a couple houses similar to this in the Locke St area….one has always been looked after, but one has always been a little run-down…..and from the time I was little, I loved those houses! I too, feel sad when I see a beautiful house abandoned and unloved. My happiness in seeing the restoration finally underway was perhaps equal to my sadness over the years in seeing it abandoned. This was a great post, Julia. It made me feel very nostalgic. Every time I drove with Grandma Thomson into the city by Snake Road, she pointed out an old house on the right, just past a ravine, just past the new cemetery. It was decaying and she wished she could have got in to see it. All that is left now in the depression of a lane way . Now I’m nostalgic too! Thanks for sharing. Yes! There are several old houses in my area that I love, but none have gotten the happy ending like yours has! I couldn’t believe it when I saw it was being restored. I love happy endings. What a great quote, Steph. It really speaks to what we’re trying to do with our own property. Thanks for sharing. Lovely post. I feel that way, too. I would love a chance to move into an unloved home with potential and totally make it beautiful again! I’d also like doing one of those fusion restorations (I don’t know what they’re really called), like turning a one-room schoolhouse or a little church into a home. It would be a neat challenge to keep the decorating style faithful to the original roots of the building. There’s a few school houses and churches around here that I see have been turned into homes. I’m always curious to get a peak inside.